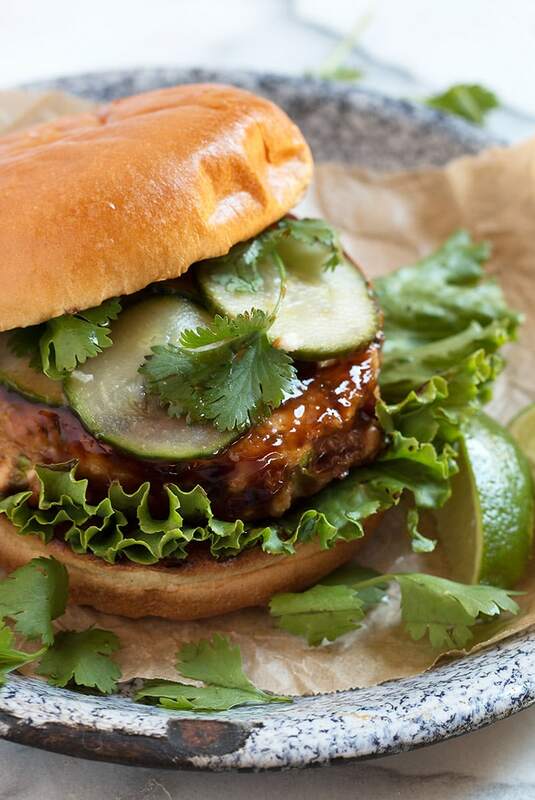 These Teriyaki Glazed Salmon Burgers can be made with fresh or frozen salmon. Topped with quick pickled cucumbers. I don’t know about you, but at the point in the Summer where I’m looking for something beyond the basic beef burger. 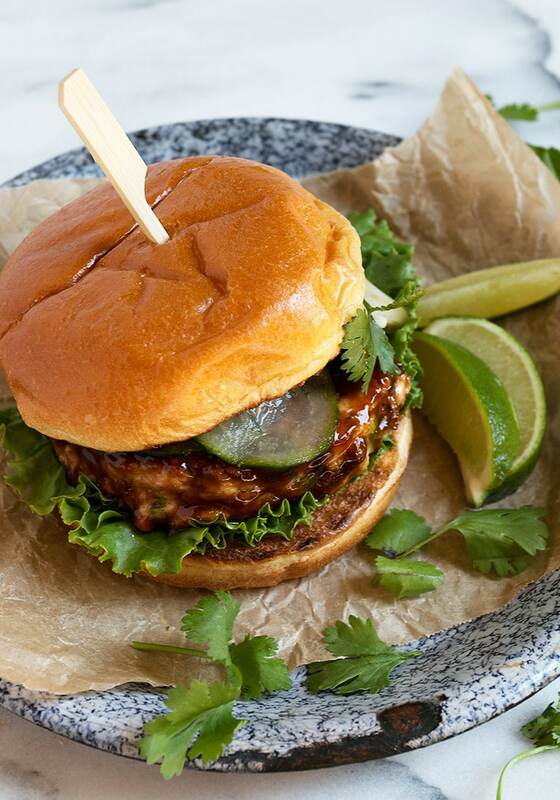 This Teriyaki Glazed Salmon burger is just the answer! 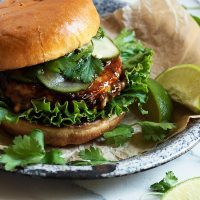 Here, a flavourful salmon burger is glazed with delicious teriyaki sauce, then combined with quick pickled cucumbers and cilantro for a delightful change from the usual. The salmon burger here is full of flavour, with herbs, ginger and soy sauce and the panko and egg white ensure it stays together perfectly as it cooks. 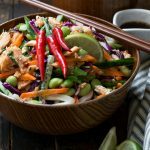 I’ve used store-bought teriyaki sauce here, for easy Summer cooking, but I’ve also included a simple, homemade teriyaki sauce recipe in the Recipe Notes below, if you’d prefer to make your own. Make the pickled cucumbers ahead and refrigerate, so you’re ready to go. You can also make the salmon patties ahead, cover and refrigerate. Then cook up later. I used a 4-inch pastry ring to help shape my patties. Any sort of ring (english muffin ring, cookie cutter – anything that’s open top and bottom) is fine. Simply add the salmon mixture to the ring then press down into a nice patty. Change it up! Use any sauce you have around and enjoy. 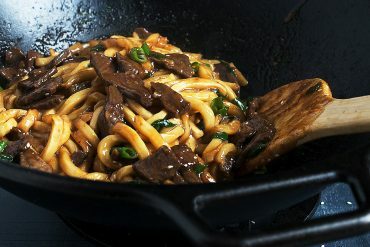 Works well with Hoisin Sauce or any semi-thick sauce that will glaze nicely. 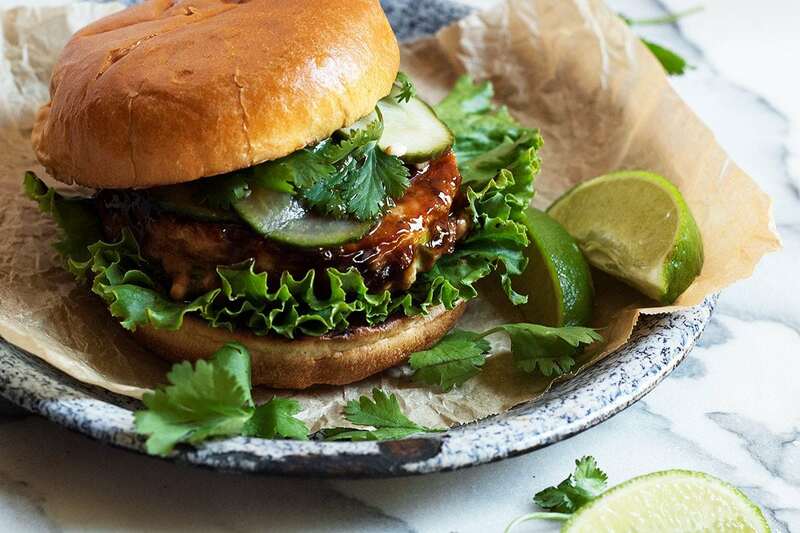 A lovely, light burger option, this flavourful salmon burger is topped with quick pickled cucumbers. Prepare pickled cucumbers by combining the water, vinegar, sugar, garlic, ginger and crushed red pepper in a small saucepan. Bring to a boil over medium-high heat. Remove from heat and add cucumber slices. Let stand 30 minutes, then drain. Refrigerate if making ahead. Prepare the salmon burgers by combining all the the salmon burger ingredients in a medium bowl. Stir well, then divide mixture into 4 equal portions. Gently shape into a 1/2-inch thick, roughly 4-inch diameter patty. Press a thumbprint into the centre of each patty. Cover and refrigerate if making ahead. Heat a large non-stick skillet over medium-high heat. Add sesame oil to pan and swirl to coat. Add salmon patties and cook patties for about 3 minutes on each side, or until cooked through. Top each patty evenly with 1 Tbsp of teriyaki sauce and allow to cook for 30 seconds more. Place a bit of lettuce on the bottom half of bun. Top with a salmon burger, then top with 6 cucumber slices and a few cilantro leaves. Add top half of bun. In a small saucepan, combine all the sauce ingredients. Bring to boil over high heat, then reduce heat to low and stir until sugar is dissolved, about 3 minutes. Remove from heat and let cool completely. Thin mixture with water to desired thickness (usually 1/4-1/2 cup water). Perfect for Summer eating, cook in the oven or right on the BBQ. 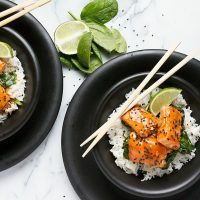 Enjoy salmon in bowl form, with this delicious maple soy glazed salmon. 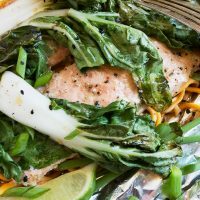 More salmon goodness in this chili lime salmon noodle bowl. 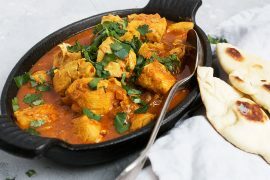 Great receipe! I made the burgers over the weekend and they were excellent. So glad to hear, Lynne and I bet it was nice with the grilled onions, too! And yes, I love how well these stay together. 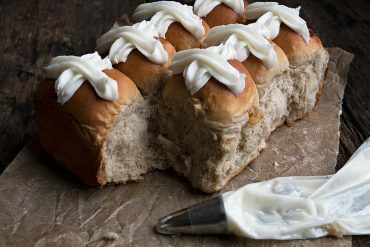 Love this gorgeous homemade glaze! It’s lunch time and my mouth is watering for a salmon burger now. 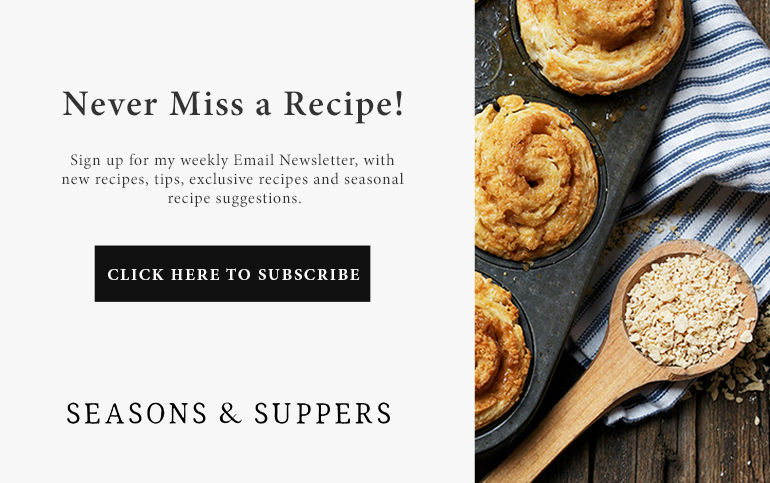 If I had to pick just one recipe blogger to follow, yours would win in a second. Seriously and without much thought about it. 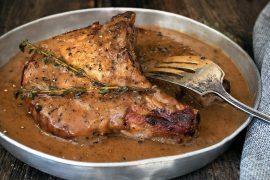 You always come up with the best recipes, and this is another wonderful example of that. We just came into some beautiful salmon, which I could eat plain(which I often do). Now I might just change that up a bit. 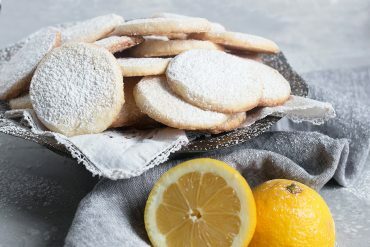 This recipe looks like a serious winner! Thanks so much, Carol :) We eat a lot of salmon here, so I’m always looking for new ways to enjoy it. Enjoy! This is one luscious looking burger! And I love those quick pickled cucumbers! YUM! I love that teriyaki glaze, what mouthwatering burgers! These were very good. Doubled the brine and pickled some onion as well. Will definitely make again. Thanks Jennifer. I don’t think I’ve ever had salmon on a burger form, but do love salmon and teriyaki so I know I’d really enjoy this! 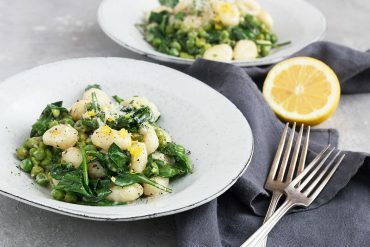 Looks just perfect for summer and a great change up from regular burgers! I want to grab everything you make right off my screen Jennifer! 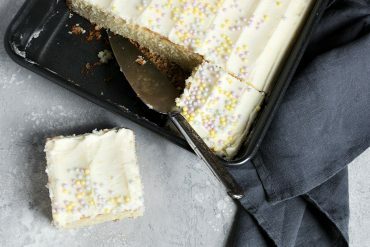 These look totally mouthwatering! Love those pickled cucumbers on top. Yes! We are getting a little tired of the same old burgers, so this looks perfect for a great summer meal. 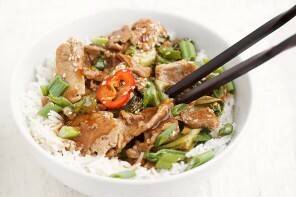 Love the pickled cucumbers and bet they go perfectly with the sweet teriyaki sauce. This is a beautiful gourmet burger! Man, Jennifer, you really know how to make me hungry, that top shot was all it took! I adore salmon any which way, but these burgers looks exceptional.